Just as the English and metric systems are two ways of representing distance, RGB and YCbCr are two ways of representing color. RGB represents all visible colors as a combination of red, green, and blue values. YCbCr on the other hand represents color as a combination of a single luminance value (the black and white portion of the image) and two values for the chroma (color) portion of the image. There are several advantages to the YCbCr representation of color. For one it's how color TV signals are compatible with black and white TVs. For another the human eye is able to resolve less color detail than luminance detail so separating them makes it easy to reduce or increase the chroma resolution as bandwidth or storage space allows. This chroma resolution is what those 4:4:4, 4:2:2, 4:2:0, etc. numbers you sometimes see are referring too, but that is another topic altogether. YCbCr is the format encoded onto DVDs and broadcast over cable, satellite, or antenna. YCbCr is the standard encoding for all analog interconnects. Digital interconnects (eg. HDMI) often carry YCbCr, but can also carry RGB signals. RGB on the other hand is how video cameras see color and how displays make color. At some point in the process of displaying an image your YCbCr signal must be converted to RGB. A YCbCr signal is converted to RGB and back by the multiplication of the RGB or YCbCr vector by a 3 x 3 matrix informally called the "color matrix". The actual values of a color matrix are derived from the red, green, and blue primaries of a particular video system. With the advent of HD (sometimes called Rec. 709) the specified primaries were changed to create a wider color gamut than SD (sometimes called Rec. 601). This is generally a good thing. With a wider color gamut more colors can be reproduced and the director's vision can be more accurately reproduced in your home. Actually I would have liked a more dramatic widening of the color gamut with HD, but we take what we can get. This wider color gamut has a ripple effect however. It means that the color matrix used to convert YCbCr to RGB and back have changed for HD signals and this has lead to a few problems. The most common problem is with upconverting DVD players. These are inherently SD devices that increase the resolution of a DVD by adding a scaler chip to the player. The signal they output is HD and will be interpreted as such by the display. That means that a YCbCr signal sent at 720p or 1080i will be converted to RGB using the HD color matrix. Many upconverting DVD players however just scale the SD YCbCr signal that is on the disc. That signal will only look right if its converted to RGB using the SD color matrix. Much more rarely (I know of no examples) do we see a problem where the SD output signals are improperly encoded with the HD color matrix. Another, less common issue arises with some displays. Some displays do not properly select a color matrix based on the signal format. This means that they can interpret SD signals using the HD color matrix resulting in the same image problems as a buggy upconverting DVD player. Less commonly it means a display can interpret HD signals with the SD color matrix resulting in a second type of image problem. Finally some devices output YCbCr signals correctly, but use the wrong color matrix to generate RGB signals. This is usually not a problem for SD DVD players since if they get something wrong it's that they tend to use the SD equations for everything. This has however been a problem for upconverting SD DVDs in high definition players. In this case if they get something wrong it is usually that they use the HD equations for everything. So what sort of image problems does this lead to? The first and most common problem is when SD YCbCr values get interpreted as HD YCbCr values. This problem is commonly referred to as "green depression". Green is the most noticeably distorted color when this occurs, but all colors will be effected. The top of the picture below shows a set of SD color bars as they should be reproduced and the bottom shows what they look like when they are converted with the HD color matrix. A second, rarer form of distortion occurs when HD YCbCr values are interpreted as SD YCbCr values. 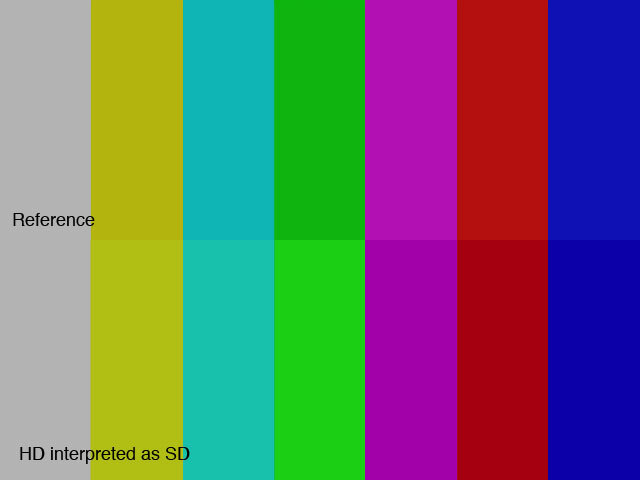 The top of the picture below shows a set of HD color bars as they should be reproduced and the bottom shows what they look like when they are converted with the SD color matrix. So how do you tell if your device has a color matrix error? Hopefully the images above will give you an idea of what right and wrong color bars should look like. 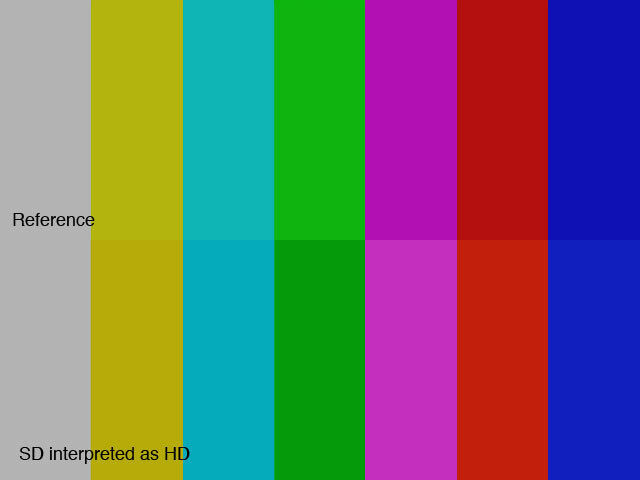 Color bars are available on all major test pattern DVDs (Digital Video Essentials, Avia, etc.) and for cable et al you can occasionally find color bars on stations after sign off or from HDNet's weekly broadcast of HD test patterns. Once you trust the devices in your setup it should be much easier to recognize a device that doesn't match the performance of other devices in your system. If you do own a device which has a color matrix error the problem can often be worked around by selecting a different output format. Try RGB instead of a YCbCr format or SD instead of HD formats. Try analog versus digital. Unfortunately, however, you may run into situations where the output mode cannot be changed or changing modes cripples the device. At this point I'm afraid to say you are likely out of luck.